Get connected with the eating disorder advocacy and body positivity community in the Triangle by checking out some of these community events! 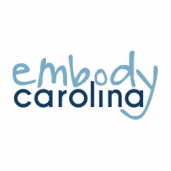 Please note that these events are not sponsored or hosted by Embody Carolina. We welcome event suggestions via the form at the bottom of this page. From the website: "​This four-week series will use discussion, yoga, and weekly self-care challenges to help you live more vibrantly and courageously in the body you already have." Know about a great event? Let us know! This form does not guarantee that an event will be posted to our site. Please only submit an event one time and refrain from submitting irrelevant events. Include a link to a Facebook event or website if possible. Please include date, time, location, cost, and any other relevant details.